The MTCR outreach mission to the Republic of Kazakhstan was held on March 28th, 2017. The MTCR delegation was led by the MTCR Chair, DG HAM Sang-wook, and consisted of representatives of the MTCR Troika, MTCR Point of Contact, Technical Experts Meeting, and other MTCR Partners. 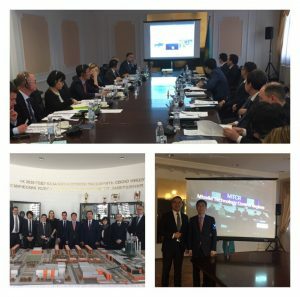 During the outreach meeting, the MTCR delegation updated Kazakhstan on recent trends in the Regime and was briefed on Kazakhstan’s export control system and space activities. Both delegations actively engaged in discussing various export-control issues. Prior to the outreach meeting, the MTCR delegation visited the National Space Center.